Description: Another unique design from knifemaker Ed Schempp. 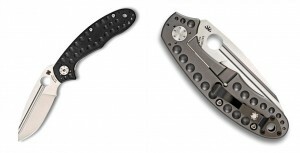 The Tuff features a bulletproof Chris Reeve Titanium Integral Lock on one side and G-10 handle on the other. Blade steel is a very large 3.75″, made from impressive CPM-3V Steel, and the knife is interestingly made in Taiwan. This entry was posted on Tuesday, July 31st, 2012 at 6:16 pm	and is filed under 3" to 4" Knives, Designer - Ed Schempp, Features - Screw Construction, Handles - G10, Handles - Titanium, Lock - Reeve Integral Lock R.I.L., Manufactured - Taiwan, Steel - CPM 3V, Type - Folding Knife, Type - Outdoors. You can follow any responses to this entry through the RSS 2.0 feed. You can leave a response, or trackback from your own site. Sorry not sure how to get a hold of Ed. Did you try Spyderco?